Circulating CD3+CD4+CD28- cells exhibit reduced apoptosis and were found to be more enriched in patients with ankylosing spondylitis than in age-matched healthy control individuals (7.40 ± 6.6% versus 1.03 ± 1.0%; P < 0.001). 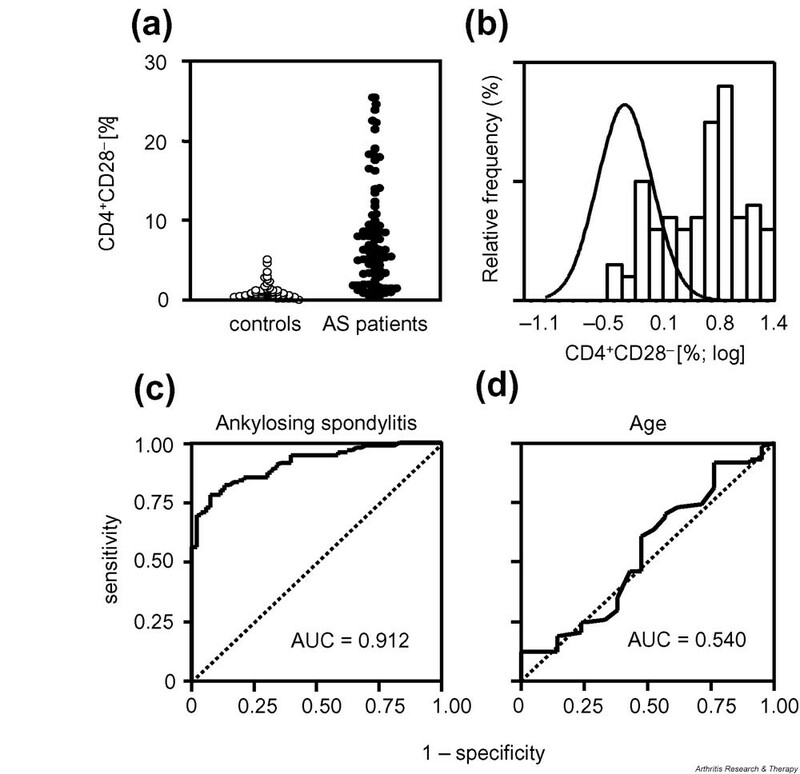 Levels of CD4+CD28- T cells correlate with disease status as measured using a modified metrology score, but they are independent of age and duration of ankylosing spondylitis. CD4+CD28- T cells produce IFN-γ and perforin, and thus they must be considered proinflammatory and cytotoxic. These T cells share phenotypic and functional properties of natural killer cells, strongly expressing CD57 but lacking the lymphocyte marker CD7. MHC class I recognizing and activating natural killer cell receptors on the surface of CD4+CD28- T cells may be involved in a HLA-B27 mediated co-stimulation of these proinflammatory and cytotoxic cells. The immunogenetic link between HLA-B27 and ankylosing spondylitis (AS) is the strongest reported association of an HLA class I molecule with a disease to date. HLA-B27 presents specific peptides to CD8+ T lymphocytes in the presence of β2-microglobulin [1, 2], and much work has concentrated on characterizing B27 restricted cytotoxic T lymphocytes in spondyloarthropathy patients [3, 4]. CD8+ cytotoxic T lymphocytes identified by the CD28- phenotype account for up to 78% of peripheral CD8+ T cells . Several more recent studies have raised the possibility that HLA-B27 may be more than a restriction element of CD8+ T cells in AS, and that HLA-B27 may be recognized even by CD4+ T cells [6, 7]. In HLA-B27 transgenic rats CD4+ T cells were used to transfer AS disease [8, 9], and in autoimmune MRL/lpr mice CD4+ T cell depletion prevented the development of arthritis . MHC class II molecules, which usually present antigenic structures to CD4+ T cells, are not necessarily required for development of AS, and MHC class II negative, B27+ transgenic mice may still develop spontaneous AS-like disease . In humans, CD4+ T cells are more frequently present than CD8+ T cells in both the peripheral blood and in biopsies of sacroiliac joints [12, 13], and T cell clones with specificity for arthritogenic bacteria exhibited the CD4+ phenotype when derived from the synovial fluids of patients with Yersinia, Salmonella, and Chlamydia-induced reactive arthritis [14–16]. However, bacteria and/or autoantigen specific CD8+ and HLA-B27 restricted T cells are also thought to contribute to the pathogenesis and regulation of the spondyloarthropathies . In other autoimmune diseases, including rheumatoid arthritis, Wegener's granulomatosis, and multiple sclerosis, an unusual subset of proinflammatory, cytotoxic CD4+ T cells was described that is rare in healthy individuals [17–20]. These T cells are clonally expanded and lack the important CD28 co-stimulatory molecule on their surface. This characteristic phenotype provides a means by which they may be distinguished from normal CD4+ T cells. Instead of the CD28-mediated co-stimulation, several alternate co-stimulatory pathways have been examined in these CD4+CD28- T cells [21, 22]. Because CD4+CD28- T cells share phenotypic as well as functional features with natural killer (NK) cells and express NK receptors on their surface [23–25], these specific T cells should receive co-stimulatory signals by recognition of ubiquitous MHC class I molecules such as HLA-B27 . The aim of the present study was to examine the prevalence and clinical relevance of CD4+CD28- T cells in a cohort of AS patients in comparison with healthy control individuals, and to characterize NK cell features and functional properties of these unusual T cells with respect to HLA-B27 mediated mechanisms. Patients with definite AS, as defined by the modified New York criteria , were recruited from the Gasteiner Heilstollen Hospital (Bad Gastein-Böckstein, Austria), as was recently described . In brief, 95 AS patients (age 49.1 ± 11.4 years) and 65 healthy volunteers (age 51.4 ± 15.2 years) were enrolled in the study. Time from onset of symptoms was 16.6 ± 12.2 years and time from diagnosis of AS was 9.9 ± 9.3 years. In AS patients the erythrocyte sedimentation rate (ESR) was elevated to 31.4 ± 20.3 mm/hour. The Health Assessment Questionnaire for the Spondyloarthropathies (HAQ-S; n = 55) , Bath Ankylosing Spondylitis Metrology Index (BASMI, n = 55)  and Bath Ankylosing Spondylitis Functional Index (BASFI, n = 75)  scores were 0.89 ± 0.51, 4.67 ± 2.05 and 5.04 ± 2.20, respectively (normal 0–3, 0–10 and 0–10). In the control individuals, inflammatory and neoplastic diseases were excluded by physical examination and detailed history. After informed consent had been obtained, peripheral venous blood was drawn and peripheral blood mononuclear cells (PBMCs) were isolated by Ficoll density gradient centrifugation. Short-term cell lines were established from fresh PBMCs stimulated with immobilized anti-CD3 (OKT3; Dako, Kopenhagen, Denmark) for 18 hours. Cells were then maintained in logarithmic growth with densities between 0.5 and 2 × 106 cells/ml in RPMI 1640 containing 10% foetal calf serum, 2 mmol/l L-glutamine and 20 U/ml recombinant human IL-2 (Sigma; St. Louis, MO, USA). Experiments were performed 7 days after initiation of the culture. Surface staining of PBMCs was performed using FITC-conjugated anti-CD4, anti-CD57, anti-CD7, anti-CD94, anti-NKB1, anti-CD158a/h (anti-KIR2DL1/anti-KIR2DS1) and anti-CD158b/j (anti-KIR2DL2/anti-KIR2DL3/anti-KIRD2S2), phycoerythrin-conjugated anti-CD28 and peridinin chlorophyll protein-conjugated anti-CD3 or anti-CD4 monoclonal antibodies (all from Becton Dickinson, San Diego, CA, USA). For detection of subdiploid apoptotic cells, cells were permeabilized with 0.05% Tween 20 and stained with 7-aminoactinomycin D (Sigma). For intracellular staining, cells were stimulated with 25 ng/ml phorbol 12-myristate 13-acetate and 1 μg/ml ionomycin in the presence of 1 μg/ml brefeldin A for 4 hours (Sigma). After cell surface staining and permeabilization, cells were stained with FITC-conjugated antiperforin, anti-IFN-γ and control immunoglobulin, respectively (Becton Dickinson). After fixation with 4% paraformaldehyde, cells were analyzed on a FACS-Calibur flow cytometer (Becton Dickinson). Gating was performed on CD4 and CD28, as appropriate, to analyze further the phenotypical and functional features of the CD4+CD28+ and CD4+CD28- T cells. Thus, the intracellular production of cytokines and the surface expression of NK receptors could be directly compared between the CD4+CD28+ and CD4+CD28- T cell cohorts. Data were analyzed using WinMDI software (Joseph Trotter, Scripps Research Institute, La Jolla, CA, USA). Short-term cell lines from HLA-B27 positive AS patients (1 × 105 cells) were incubated with the HLA-B*2705 transfected cell line C1R-B27 and the nontransfected cell line C1R (5 × 104 cells), and cells were either stimulated by cross-linking the T cell receptor with anti-CD3 (OKT3) or not. The original C1R cell line is of lymphoblastoid origin and was selected for loss of HLA class I antigen expression. C1R derived cells express no HLA-A or HLA-B products, but they do express small amounts of HLA-Cw4. For blocking experiments the unconjugated monoclonal antibodies specifically directed against CD94 and CD158b/j (KIR2DL2/KIR2DL3/KIR2DS2; Becton Dickinson) were each used at concentrations of 20 μg/ml. Single antibodies were not tested. After 24 hours parallel cultures were harvested and the expression of CD25 was determined by three-colour fluorescence activated cell sorting (FACS) analysis. In order to identify a possible HLA-B27 mediated enrichment of CD28- T cells in the CD4+CD25+ T cell compartment, fresh PBMCs (1 × 105) from three HLA-B27 positive AS patients were incubated in RPMI 1640 and 10% fetal calf serum together with the Tap 1 and 2 and MHC class II deficient HLA-B*2705 transfected cell line T2-B27 or the nontransfected control cell line T2 (5 × 104) in the presence or absence of stimulation by cross-linking the T cell receptor with immobilized anti-CD3 (OKT3). The T2-B27 cell line expresses a variety of different forms of HLA-B27, including free B27 H chain monomers, homodimers and low levels of B27 heterodimers, but no HLA class II molecules . After 36 hours parallel cultures were harvested and the expression of IL-2 receptor α chain (CD25) was determined, together with CD4 and CD28 expression, by three-colour FACS. Investigators assessing Epstein–Barr virus (EBV) and cytomegalovirus (CMV) seropositivity were blinded to the sera of 30 AS patients of different ages. Anti-EBV and anti-CMV IgG antibodies were identified using enzyme-linked immunosorbent assay kits from Aventis Behring (Vienna, Austria), in accordance with the manufacturer's instructions. The two-sided paired t-test, the Wilcoxon ranking test, the Kruskal–Wallis test and regression analysis by receiver operating curves were performed using the SPSS program, version 11.0 (Chicago, IL, USA). Bonferroni adjustment was performed in case of multiple testing of clinical measurements. P ≤ 0.05 was considered statistically significant. Values are expressed as mean ± standard deviation. Percentages of CD3+CD4+CD28- T cells were determined in the peripheral blood from 95 consecutive AS patients and 65 age-matched healthy control individuals by flow cytometry analysis. In AS patients the percentage of CD3+CD4+ T cells lacking the co-stimulatory molecule CD28 was significantly increased as compared with the control individuals (7.40 ± 6.6% versus 1.03 ± 1.0%; P < 0.001; Fig. 1a). Logarithmic transformation of the percentages of CD4+CD28- T cells was used to correct for data skewing and to detect different populations of CD4+ T cells. A cumulative frequency distribution showed an underlying bimodal distribution of the frequencies of CD4+CD28- T cells (Fig. 1b). The cutoff value determined at the intersection of the two bimodal distribution curves was 1.7%. Using this cutoff value, 70.3% of the AS patients had increased levels versus 6.5% in the control group. Levels of CD3+CD4+CD28- T cells in patients with ankylosing spondylitis and healthy control individuals. (a) Accumulation of CD3+CD4+CD28- cells in peripheral blood mononuclear cells of 95 patients with ankylosing spondylitis (AS; ●) and 65 age-matched healthy control individuals (3). The Mann–Whitney test was used to determine statistical difference. (b) Logarithmic transformation of percentages of CD3+CD4+CD28- T cells was performed to detect different populations of CD4+ T cells and to correct for data skewing. We found a bimodal distribution of frequencies of CD3+CD4+CD28- T cells (line for healthy control individuals, boxes for patients with AS). The cutoff value, which was determined at the intersection of the two bimodal distribution curves, was 1.7%. Using this value as cutoff, 70.3% of the patients had increased levels as compared with only 6.5% of the control group. (c, d) As a regression model, receiver operating curves were used to display sensitivity and specificity of CD28- T cell levels for AS disease and age. The area under the curve (AUC) was determined for both independent parameters. As regression models for AS disease and age, receiver operating curves were applied to display sensitivity and specificity of CD4+CD28-levels. The area under the curve was calculated to be 0.912 for AS disease and 0.540 for the age of those patients who had 1.7% or more CD4+CD28- T cells in peripheral blood (Fig. 1c,1d). These findings reflect high sensitivity and specificity of CD4+CD28- T cell levels for AS disease when compared with healthy control individuals, but demonstrate the lack of correlation between the levels of CD4+CD28- T cells and age. To detect a possible association between CD4+CD28- T cells and disease status, patients were grouped according to their movement restrictions and functional measurements. The nonparametric Kruskal–Wallis test was used to compare patient groups with minor, mean and major restrictions. Out of the clinical and serological measurements, a correlation between CD4+CD28- T cells and reduction in height since onset of disease (P = 0.037) and increased ESR (P = 0.047) was detected (Fig. 2a,2b; Table 1). With respect to movement restrictions, a trend was found only for the correlation between the percentage of CD4+CD28- T cells and patient groups with minor, mean and major restrictions according to the BASMI score (P = 0.063; Fig. 2c). 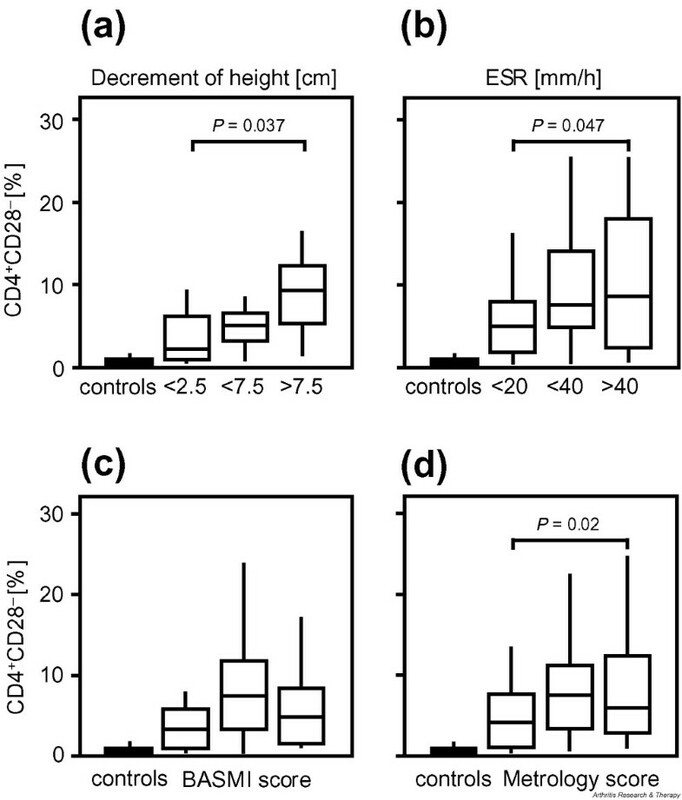 Associations between CD3+CD4+CD28- T cell levels and (a) decrement in height, (b) erythrocyte sedimentation rate (ESR), (c) Bath Ankylosing Spondylitis Metrology Index (BASMI) and (d) a newly calculated metrology index. The Kruskal–Wallis test was used to compare levels of CD4+CD28- T cells from patient groups with minor, mean or major restrictions. Whiskers boxblots show 50% of cases within the boxes and 80% between the end-points of the whiskers (lines). P ≤ 0.05 was considered statistically significant. Using the Kruskal–Wallis test with subsequent Bonferroni adjustment, there was no association between the levels of CD3+CD4+CD28- T cells and grade of clinical restriction in ankylosing spondylitis patients. Patients were grouped in those with minor restrictions (cervical rotation in sitting and lying position > 70°, tragus to wall distance < 15 cm, chin to jugulum distance < 3 cm, head to wall distance < 5 cm, chest expansion > 6 cm, thoracic Schober test > 32 cm, modified Schober test > 6 cm, lumbar side flexion > 10 cm, fingers to floor distance < 20 cm, intermalleolar distance > 100 cm), those with mean restrictions, and those with major restrictions (cervical rotation in sitting and lying position < 15°, tragus to wall distance > 22 cm, chin to jugulum distance > 6 cm, head to wall distance > 20 cm, chest expansion < 2 cm, thoracic Schober test < 30.5 cm, modified Schober test < 3 cm, lumbar side flexion < 5 cm, fingers to floor distance > 50 cm, intermalleolar distance < 70 cm). Based on the results with CD8+CD28- T cells in AS patients, we proposed a modified metrology score summarizing measurements for cervical rotation in sitting position, chin to jugulum distance, thoracic Schober test, chest expansion and fingers to floor distance, but not tragus to wall distance, intermalleolar distance, modified Schober test and lumbar side flexion, as included in the BASMI score . When patients were grouped according to their restriction as measured using this modified metrology index, the percentage of CD4+CD28- T cells correlated with the disease status (P = 0.02; Fig. 2d). No correlation was detected between the percentage of CD4+CD28- T cells and time since onset of symptoms, duration of disease, HAQ-S score, BASFI score, levels of C-reactive protein and blood cell counts. Spontaneous apoptosis in CD4+CD28+ and CD4+CD28- T cells from short-term cell lines of healthy control individuals and AS patients was identified from the fraction of subdiploid cells in CD4+ cells after staining of DNA using 7-aminoactinomycin D. Three days after the last addition of recombinant human IL-2, 16.2 ± 5.9% of the CD4+CD28+ but only 0.7 ± 1.1% of the CD4+CD28- T cells were apoptotic (n = 4; P < 0.001; Fig. 3a). Because CD4+CD28+ and CD4+CD28- T cells were maintained under identical conditions, differences in the apoptotic rate cannot be attributed to tissue culture conditions. In the healthy control individuals, 15.8 ± 0.8% of the CD4+CD28+ T cells were subdiploid cells (n = 3). There was no CD4+CD28- T cell population in the healthy control individuals tested. (a) Spontaneous apoptosis, and activation-induced intracellular production of (b) IFN-γ and (c) perforin in CD28+ and CD28- CD4+ T cells from patients with ankylosing spondylitis (AS). For determination of subdiploidy, peripheral blood mononuclear cells of healthy control individuals and AS patients were surface stained with monoclonal antibodies directed against CD4 and CD28, and then intracellularly stained with 7-aminoactinomycin D. Peripheral blood mononuclear cells were stimulated with phorpbol 12-myristate 13-acetate and ionomycin in the presence of brefeldin A. Cells were stained with fluorescence-labelled monoclonal antibodies (mAb) directed against CD4, CD28 and either IFN-γ or perforin, and counted by flow cytometry. The number of positive cells were compared between CD28+ and CD28-CD4+ T cells using the two-sided paired t-test. P ≤ 0.05 was considered statistically significant. PE, phycoerythrin; PerCP, peridinin chlorophyll protein. Intracellular staining for perforin and IFN-γ was performed in activated cells to determine the number of cytokine producing cells. Production of perforin was more frequent in CD4+CD28- T cells than in their CD28+ counterparts (35.9 ± 18.7% versus 1.0 ± 0.6% perforin-producing cells; n = 12; P < 0.001). Nonspecific staining with IgG control antibodies was negligible (0.5 ± 0.4% IgG positive cells in both CD4+CD28+ and CD4+CD28- T cells; Fig. 3c). Intracellular staining of IFN-γ showed that production of IFN-γ was also more frequent in CD4+CD28- T cells (37.9 ± 20.4% IFN-γ positive cells versus 0.3 ± 0.2% cells stained with IgG control antibodies) than in their CD28+counterparts (9.3 ± 3.1% IFN-γ positive cells versus 0.3 ± 0.2% cells stained with IgG control antibodies; n = 7; P = 0.006; Fig. 3b). For phenotypic characterization of CD4+CD28- T cells, surface expressions of CD57 and CD7 were compared between the CD28+ and the CD28- CD4+ T cell compartments. The CD57 molecule is a 110 kDa glycoprotein that is presented by NK cells. The CD7 molecule, which is involved in T cell activation, is present in most normal human T cells under physiological conditions, but not on NK cells . CD57 surface expression was higher on CD4+CD28- T cells than on CD4+CD28+ T cells (63.0 ± 29.5% versus 1.0 ± 0.6 %; n = 7; P = 0.001), whereas the expression of CD7 was 72.4 ± 11.2% on CD28+ but only 3.4 ± 2.1% on CD28- CD4+ T cells (n = 7; P < 0.001; Fig. 4a). 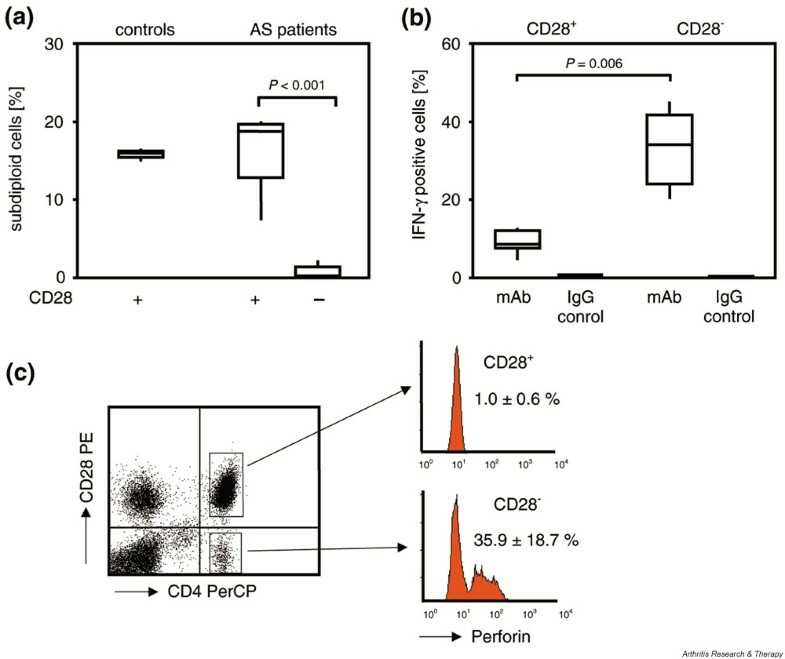 Phenotypic characterization of CD4+CD28- T cells. (a) Surface staining of CD4+ T cells was performed using monoclonal antibodies directed against the natural killer cell marker CD57 and the lymphocyte marker CD7 (n = 7). (b) Further staining was performed using the specific antibodies directed against the natural killer cell immunoglobulin-like receptors CD158a/h (KIR2DL1/KIR2DS1), CD158b/j (KIR2DL2/KIR2DL3/KIR2DS2) and NKB1 and the C-type lectin receptor CD94. Whiskers box blots show the results of 11 independent experiments, with 50% of cases within the boxes and 80% between the end-points of the whiskers (lines). The Wilcoxon test was used to determine statistical differences. Surface expressions of NK receptors, including killer cell immunoglobulin like receptors (NKB1, CD158a/h [KIR2DL1/KIR2DS1], CD158b/j [KIR2DL2/KIR2DL3/ KIR2DS2]) and the C-type lectin receptor CD94, were examined in 11 subsequent patients with increased levels of CD4+CD28- T cells. Of the NK receptors, NKB1 is considered to be inhibitory, whereas CD94, CD158a/h and CD158b/j are considered inhibitory or activating NK receptors . All 11 patients expressed at least one of these NK receptors on the surface of their CD4+CD28- T cells. As shown in Fig. 4b, all NK receptors were exclusively found on the CD4+ T cells that lacked the CD28 surface molecule. Low levels of inhibitory NKB1 were detected on CD4+CD28- T cells (2.8 ± 4.4% versus 0.2 ± 0.1%; P = 0.003), whereas CD158a/h (KIR2DL1/ KIR2DS1) was detected neither on CD4+CD28- nor on CD4+CD28+ T cells (0.7 ± 1.9% versus 0.1 ± 0.1%). The expression of the other NK receptors CD94 (10.2 ± 10.0%) and CD158b/j (KIR2DL2/KIR2DL3/ KIR2DS2; 12.4 ± 18.6%) was increased on CD4+CD28-cells as compared with their CD28+ counterparts (0.6 ± 0.9% versus 0.4 ± 0.3%; n = 9; P = 0.006 and 0.003, respectively; Fig. 4b). To examine possible NK receptor-mediated effects of HLA-B27 on activation of CD4+CD28- T cells, short term cell lines were co-cultured with the HLA-B*2705 transfected cell line C1R-B27 or the nontransfected cell line C1R in the presence or absence of CD3 mediated stimulation. 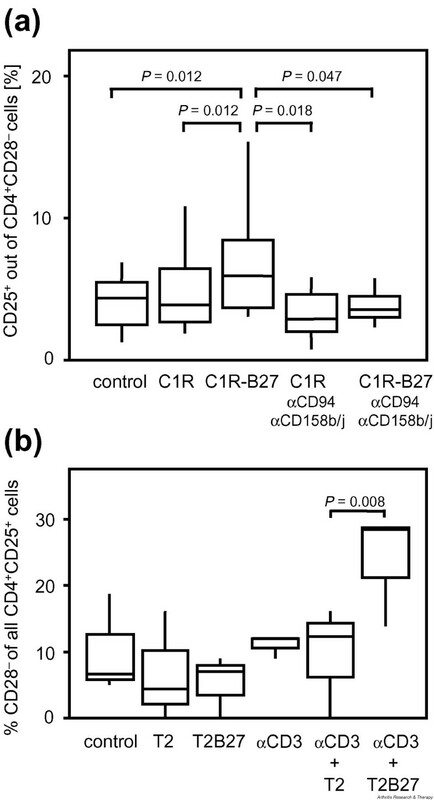 This co-incubation with HLA-B27 transfected C1R cells resulted in an increased expression of CD25 on CD4+CD28- T cells in the presence of cross-linking of T cell receptors as compared with co-incubation with nontransfected C1R cells (P = 0.012) and cross-linking of T cell receptors alone (P = 0.012; Fig. 5a). No changes in CD25 expression were seen on the CD4+CD28+ T cells. To examine whether this effect was mediated by the NK receptors on CD4+CD28- T cells, antibodies specifically directed against the NK receptors (anti-CD94 and anti-CD158b/j [KIR2DL2/KIR2DL3/KIR2DS2]) were added to parallel cultures. Indeed, the HLA-B27 mediated effect was reversed by blockade of NK receptors (P = 0.047), thus supporting a possible co-stimulatory role of NK receptors in CD4+CD28- T cells. HLA-B27 mediated expression of the α chain of the IL-2 receptor (CD25) as an activation marker on CD4+CD28- T cells. (a) Short term cell lines from HLA-B27 positive patients with ankylosing spondylitis were cross-linked to anti-CD3 directed immobilized antibodies (α CD3), incubated with HLA-B27 transfected C1R cells (C1R-B27) or untransfected cells (C1R) and controls, and exposed to antibodies directed against the NK receptors CD94 and CD158b/j (KIR2DL2/KIR2DL3/KIR2DS2), as indicated. (b) Fresh peripheral blood mononuclear cells were incubated together with anti-CD3 and HLA-B27 transfected T2 cells (T2-B27) or untransfected cells (T2) as indicated, harvested after 36 hours, and surface stained for CD4, CD28 and CD25. Whiskers box blots show the results of the independent experiments, with 50% of cases within the boxes and 80% between the end-points of the whiskers (lines). The two-sided paired t-test was used to determine statistical differences. To investigate whether these HLA-B27 mediated mechanisms are also detectable in fresh PBMCs and would result in an enrichment of CD28- T cells in the CD25+ T helper cell compartment, fresh PBMCs were co-cultured with the HLA-B27 transfected Tap deficient cell line T2 (T2-B27) in the presence or absence of immobilized anti-CD3. Co-stimulation of T cells with anti-CD3 and T2-B27 over 36 hours resulted in an increased percentage of CD28-cells in the compartment of CD4+CD25+ cells when compared with parallel assays with anti-CD3 and T2 (P = 0.008), T2 or T2-B27 cells alone (Fig. 5b). Of the AS patients tested, 96.7% were positive for EBV IgG and 60% were positive for CMV IgG . There was no correlation between the levels of CD4+CD28- T cells and the EBV IgG titres. However, levels of CD4+CD28- T cells correlated positively with the CMV IgG titres (r = 0.542; P = 0.002). On the other hand, levels of CD4+CD28- T cells did not differ between patients who were positive or negative for CMV IgG (7.9 ± 8.5% and 6.4 ± 5.5%, respectively). The CMV IgG negative AS patients had levels of CD4+CD28- T cells ranging up to 18.1%. The only patient who was seronegative for EBV was seropositive for CMV, and had 21.4% CD4+CD28- T cells. Taking 1.7% as a cutoff level between normal and pathological percentages of CD4+CD28- T cells, we did not find a difference in EBV specific or CMV specific IgG titres between patients with low and high levels of CD4+CD28- T cells. The present study shows that circulating CD3+CD4+CD28-cells were expanded in the peripheral blood of AS patients but not in age-matched healthy control individuals. The percentages of CD4+CD28- T cells were clearly lower than those of CD8+CD28- T cells in AS patients (7.40 ± 6.6% and 41.1 ± 17.7%, respectively) . Increased levels of CD4+CD28- T cells have been described in patients with rheumatoid arthritis, Wegener's granulomatosis and multiple sclerosis [17–20]. Although they also occur in unselected elderly individuals , the expansion of these cytotoxic and proinflammatory CD4+ T cells in AS disease was unexpected. AS is clearly associated with the MHC class I molecule HLA-B27, and not with MHC class II molecules. Until now, elevated percentages of CD4+CD28- T cells have only been described in autoimmune diseases with established associations with specified MHC class II molecules. Our findings support a possible role of CD4+ T cells even in AS – a MHC class I associated disease – as suggested by animal studies [8–10] and immunohistological studies of sacroiliac biopsies . Further studies are needed to establish the role of IFN-γ in AS, but the rapid release of this T-helper-1 type cytokine by CD4+CD28- T cells may be important in sustaining synovitis, which is comparable to its role in rheumatoid synovitis . In addition, CD4+CD28- T cells produce perforin, a membranolytic protein that is expressed in the cytoplasmic granules of cytotoxic T cells and NK cells, providing them with the ability to lyse target cells. Thus, CD4+CD28- T cells are distinct from classic T helper cells in several aspects. From the clinical perspective, the presence of CD4+CD28- T cells in AS patients did not correlate with disease parameters such as time from onset of symptoms or disease duration, with serological parameters such as levels of C-reactive protein and blood cell counts, and with established clinical measurements such as scores for functional impairment (BASFI), disease status (BASMI) and general health (HAQ-S) [28–30]. However, after grouping patients into those with minor, mean and major decrement in height (from onset of the disease), and those with minor, mean and major elevations in ESR, a correlation was found between these parameters and the peripheral levels of CD4+CD28- T cells (Fig. 2a,2b). These findings support the clinical relevance of CD4+CD28- T cell levels to disease status and chronic inflammation, as found in patients with rheumatoid arthritis and Wegener's granulomatosis [19, 36]. Interestingly, there was no correlation between CD3+CD4+CD28- cells and established BASMI score, but again there was a correlation with our recently described modified metrology index . Thus, the percentage of CD4+CD28- T cells in AS patients appears to reflect the anatomical restrictions and status of disease, but not functional and quality of life restrictions. Other factors, including age, were not correlated with levels of CD4+CD28- T cells in our cohorts of AS patients and healthy control indivuduals, although others had observed an accumulation of CD4+CD28- T cells in unselected elderly patients . This observation can be explained by the fact that more than 80% of all probands were younger than 60 years and all control individuals were pre-selected for a history not suspicious for an acute or chronic inflammatory disease. We suspect that increased levels of CD3+CD4+CD28- T cells in the elderly may be a consequence of reduced apoptosis and persistence of these cells after an inflammatory disease over the years. Taken together, we believe that a specific metrology index is superior for describing disease status as an integral function of AS duration and activity. A possible involvement of EBV in the pathogenesis of AS was recently suggested because different HLA-B27 subtypes are able to present the same EBV peptide . In our study the levels of CD4+CD28- T cells did not correlate with EBV IgG titres, suggesting a minor role of EBV in relation to the CD4+CD28- T cells. Irrespective of EBV, CD4+CD28- T cells were more expanded in CMV seropositive AS patients, as was described for healthy individuals and seropositive patients with RA . Interestingly, HLA-B27 interacts with CD4+ T cells via several different modes of action. First, Boyle and coworkers  and other investigators  described human HLA-B27 specific CD4+ T cells that proliferated in response to B27-transfected cells without cross-linking of the T cell receptor. Most of the HLA-B27 mediated proliferative effect could be inhibited by CD4 specific monoclonal antibodies, suggesting a CD4 mediated recognition of the HLA-B27 molecule. In addition, CD4+ T cells can recognize ubiquitous MHC class I molecules by NK receptors on their cell surface . Recent studies suggest a role of abnormal HLA-B27 molecules, especially HLA-B27 heavy chain homodimers, in the pathogenesis of spondylarthropathies [7, 31]. These aberrant forms of HLA-B27 can be recognized by immunomodulatory killer cell immunoglobulin receptors, such as KIR3DL1 and KIR3DL2, and the immunoglobulin-like transcript ILT-4. Indeed, the CD4+CD28- T cells from AS patients that we tested expressed high levels of CD57 and NK receptors, but they lacked expression of CD7, thus sharing typical NK cell features . The expression of NK receptors on CD4+CD28- T cells in AS patients resembles that in rheumatoid arthritis patients, even though these two diseases are associated with different classes of MHC molecules. It is clear that not only CD4+CD28- T cells from rheumatoid arthritis and melanoma patients but also those from AS patients show NK cell features and represent a hybrid lineage of NK T cells . Activating NK receptors on the cell surface may recognize HLA-B27 . Thus, an activating effect of HLA-B27 on CD4+CD28- T cells may be expected, even in AS disease. As in rheumatoid arthritis, NK receptor mediated recognition of MHC class I molecules without the obligatory presence of specific peptides may be important, especially during a prolonged course of disease, independent of concurrent antigen presentation . At least in part, CD4+CD28- T cells appear to be under peptide-independent control of MHC class I molecules by signalling through activating NK receptors. Cytotoxic, proinflammatory CD4+ T cells are enriched in the peripheral blood of AS patients. These unusual CD4+CD28- T cells share phenotypic and functional properties of NK and T cells. NK receptor mediated recognition of HLA-B27 may be responsible for peptide independent activation of these CD4+ T cells in AS disease. Thus, the model of CD4+CD28- NK T cells initiating and sustaining immune responses, and providing a link between the adaptive and the innate immune systems, may hold true for AS disease. The study was supported by the 'Verein zur Förderung der Hämatologie, Onkologie und Immunologie', Innsbruck, and by the Gasteiner Heilstollen GesmbH, Badgastein, Austria.